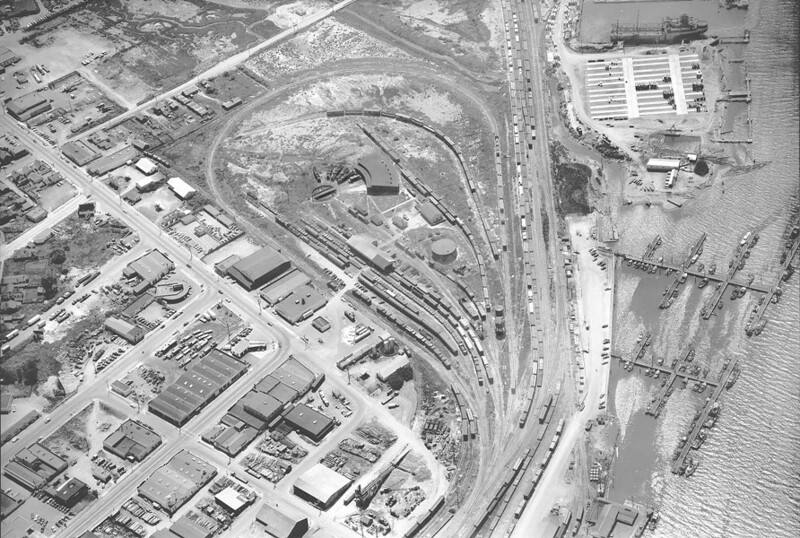 Eureka's Balloon Track, as seen from the sky in 1952. It easily could have been taken as an April Fool's joke. On April 1, Security National Vice President Mike Casey filed papers with the California Coastal Commission, withdrawing the company’s application for a coastal development permit that would have paved the way for the first phase of the long-debated Marina Center development on Eureka’s blighted Balloon Track property. The permit application has been pending for years, since Humboldt Baykeeper appealed the permit’s approval by the Eureka City Council, pushing the matter before the Coastal Commission. The appeal process had essentially stalled in a standoff between Security National subsidiary CUE VI and the Coastal Commission, with Coastal Commission staff requesting a host of documentation from CUE VI in order to vet the permit and the developers refusing to comply. Jim Baskin, a supervising coastal planner with the commission, said Casey’s withdrawal of the company’s permit application actually came at the request of commission staff as a part of some “spring cleaning. In the case of CUE VI’s application, the answer was essentially yes. But that doesn’t mean CUE VI has abandoned plans to develop the contaminated former rail yard that sprawls 43-acres south of Old Town that it purchased in 2006. It’s just that the battle has moved to other fronts. An artistic rendering of the proposed Marina Center development, complete with an 11-acre wetland reserve. 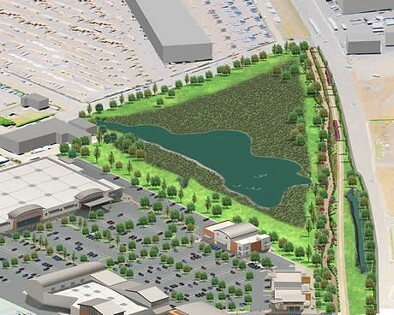 CUE VI had proposed building a large, mixed-use development that would include retail, office and residential space anchored by a Home Depot, as well as an 11-acre wetland reserve. The development permit would have cleared the way for CUE VI to move forward with its initial cleanup of the property — a plan environmental groups lambasted as grossly inadequate — and the creation of the wetland reserve. Baskin said the Northern California Regional Water Quality Control Board continues to work with CUE VI on a final remediation plan for the property but it’s unclear where that process stands as board staff did not immediately return calls seeking comment for this story. But Craig Hunt, a senior water resource control engineer with the board, said that’s not entirely accurate. Meanwhile, the project does still have one active Coastal Commission file. Back in November 2010, 69 percent of Eureka voters approved a ballot measure — Measure N, with the slogan “Marina Center Now” — changing the Balloon Track property’s zoning from public to designations that would allow for the mixed-use development. Because the property sits in the coastal zone, the zoning change needs to be approved by the commission. And, lurking in the background of all this, are a pair of lawsuits filed by Humboldt Baykeeper challenging both Measure N and the Environmental Impact Report approved by the Eureka City Council in 2009. Both suits have been shelved, but can be dusted off if there is any movement on plans to develop the site, said Baykeeper Director Jenn Kalt, who added that the city performed no California Environmental Quality Act review for Measure N and passed the inadequate EIR with little time for review. “It was as if the laws of the state of California don’t apply,” she said. As to CUE VI pulling its application for a permit to move forward with its cleanup of the property, Kalt said “it’s the end of what was going to be a fake cleanup. Kalt said it’s a shame that Rob Arkley, who owns Security National, didn’t move forward with a public visioning process funded by the Headwaters Fund that was set to begin at the time he purchased the property and opted to push forward his own Marina Center vision. Today, Kalt said a look back might be the best step forward. Casey didn’t return a message seeking comment for this story, but the last time Security National leadership commented publicly on the project they dismissed any talk of its demise. For those readers new to the area who would like to be brought up to speed on what's been potentially the most politically divisive piece of property in Humboldt County, check our archives here. Editor's Note: This post was updated from a previous version to include the comments of Craig Hunt of the Northern California Regional Water Quality Control Board.